Dogs are descendants of wolves, and wolves are synonymous with snow. It’s hard to imagine Canis lupus stalking prey without a backdrop of silent winter white. While some domestic dogs still share many traits with the mighty timberwolf, others are less equipped to handle the elements. I doubt a Bichon Frise finds much enjoyment in getting dumped out of its luxurious leather purse into a pile of powder snow. 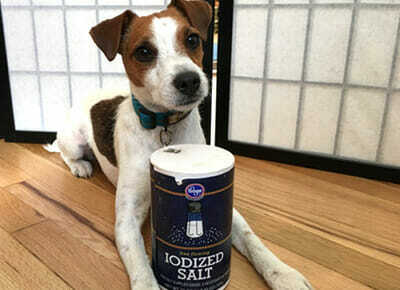 Fortunately, in this Golden Age of Adventure Dogs, many companies make products that help even the most domestic of breeds romp around in the cold. Here are some tips to keep your best friend safe and comfortable this winter, whether you’re summiting mountains, snowshoeing through a meadow or walking around the city block. The toughness of dog footpads varies wildly. 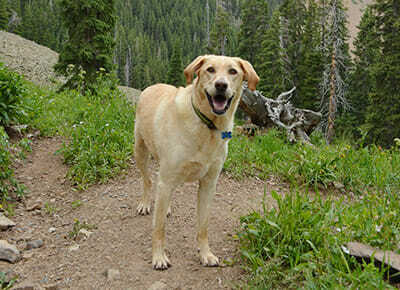 Many pups can traverse sharp talus for hours without issue, while others would be bleeding and sore on the same terrain. The same is true of snow and ice, but even sled dogs need vigilant monitoring and occasional paw protection. Dog booties are almost required gear in winter. Even if your pup doesn’t normally need them, they’re essential for extra-cold days or in an emergency. Get your dog comfortable wearing them at home before hitting the trail, or you might not make it very far. Also remember to check them regularly for proper fit and to ensure snow isn’t sneaking in and freezing around the top opening. Even with booties and wax, make a habit of regularly checking your dog’s paws, clearing them of ice buildup and observing for any signs of pain or discomfort. Forecasting winter weather and snow conditions is an inexact science, especially in the mountains. Countless times, I’ve driven two hours to a trailhead in Colorado’s high country only to find temperatures 15 degrees colder or winds three times as strong as predicted. Dogs are living, breathing beings, prone to good days and bad days. One weekend they might plow through snowdrifts for hours with nary a shiver, and the next they might be picking up their paws and whining before you even get out of the parking lot. Play it safe. Especially if you’re traveling an hour or more from the car, there’s simply too much that can go wrong in the relentless winter elements to justify pushing your luck. Mistakes in the summer can be a mild inconvenience. Mistakes in the winter can result in major injury, or even death. Have a backup plan — something shorter, lower, drier, more protected. Sometimes this means scrapping an adventure altogether. Cuddling on the couch and crying into a mug of hot chocolate while watching All Dogs Go to Heaven is preferable to visiting the vet to treat frostbitten paws. Know your dog, observe them carefully and always be willing to turn around if it’s in their best interest. No matter how much fun it looks like your dog is having doing it, eating snow isn’t an adequate method of hydration. Snow is mostly air, and getting the necessary liquid would require consuming many mouthfuls. The effort a body has to go through to melt snow saps too much energy and warmth for it to be an effective source of fluids. Natural streams and lakes are likely solid ice through the winter, as water has the unfortunate habit of freezing when exposed to temperatures below 32 degrees Fahrenheit. Carry plenty of extra water for your dog, as well as yourself, inside your pack and wrapped in an insulating sleeve or your extra clothing layers. Dozens and dozens of options exist from many different brands. For winter use, look for a jacket with a shell outer layer or synthetic insulation. (Or, preferably, both.) Hard or soft shell material repels moisture, and synthetic insulation stays warm even when it gets wet. This is important for when your dog is creating World War I-style trenches through neck-deep snow at breakneck speed. Dog jackets are great for warmth, obviously, but they also cut the wind and protect a pup’s belly from clinging snow. With the exception of dogs explicitly bred for frigid conditions, they’re a pretty necessary piece of winter equipment. 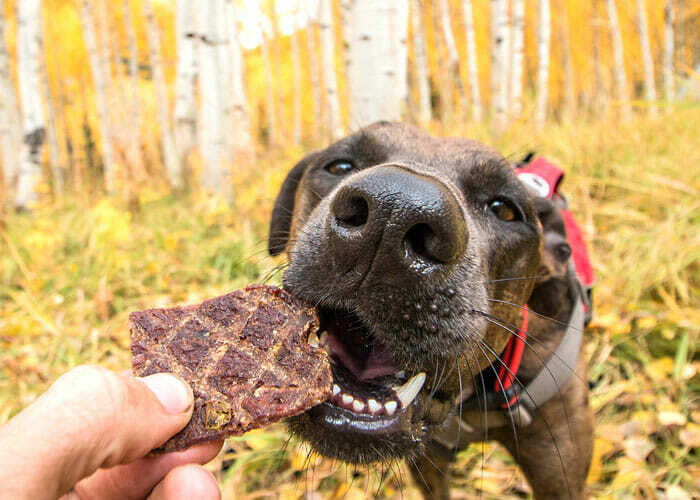 As with human food, some dog treats can become so hard in cold weather that they’re extremely difficult to eat. This might require a bit of trial and error depending on your preferred brands, but identify treats that stay soft and easy to chew even as the temperature dips well below freezing. SuperFood Blend, Power Bones and PureNZ Cords are all great options from Zuke’s. Another tip is to carry your dog’s treat pouch on your person, instead of in a backpack. By storing it in one of your jacket or pants pockets, your body heat keeps the treats from becoming too rigid to chew. This is highly recommended for most human food as well, unless you enjoy chipping a tooth on your Snickers bar. No one wants to sit on cold snow for too long. Humans have the luxury of squatting on their backpack or tree stumps or whatever else is convenient for avoiding direct contact with the ground, but dogs don’t usually have such options. Bring along a blanket or foam pad for your pooch to rest on during breaks. Several companies even make lightweight, packable, insulated dog beds. You want your pup to have a warm, comfortable spot to rest, or they might be an icicle before you getting moving again. Like with mountain bikes in the summer, dogs should be trained to ignore and stay out of the way of riders. Something about skis sets off the herding instinct in many breeds. It’s a scary, fast, foreign method of travel to which many dogs aren’t accustomed, and a frightened pooch can get loud and defensive. I’ve witnessed quite a few wipe outs as a skier rounds a corner only to meet a startled, barking dog. Ski edges are also sharp and moving fast, and they can cause a nasty laceration to an onrushing pup. Use treats and conditioning to ensure your dog is comfortable with skiers and snowboarders, or keep them on a leash in areas popular with those pursuits. For training tips, check out Helping Your Dog Become a Perfect Outdoor Companion. Dogs don’t understand hazards in the same ways as humans. A partially frozen lake, to them, is just more ground to romp on. Keep a vigilant mental account of your surroundings at all times and have your dog on a leash or under strict voice control in areas that could potentially be dangerous. Don’t let them on a frozen surface unless you’re 100 percent sure it’s safe. Even then, it’s probably best to avoid the ice if at all possible. The difference between being in the clear and in an avalanche runout zone can be as little as a few meters. Many off-leash dogs wander. Take an avalanche course, know how to travel safely in wintery mountain terrain, and keep your pup close when warranted. Hiking in the snow, with dogs that love it and humans that are prepared, can be exponentially more rewarding than summer trails. If you’re lucky enough to have a powderhound, I hope these tips help you enjoy the backcountry with more fun, comfort and peace of mind. Cover photo of Loki with winter hiking gear by #ZukesPack ambassador Miranda Harmon, @mirandashea24. Jeff Golden and his rescued rez dog, Zia, spend most of their off days wandering above treeline in the San Juan Mountains of Southwest Colorado. 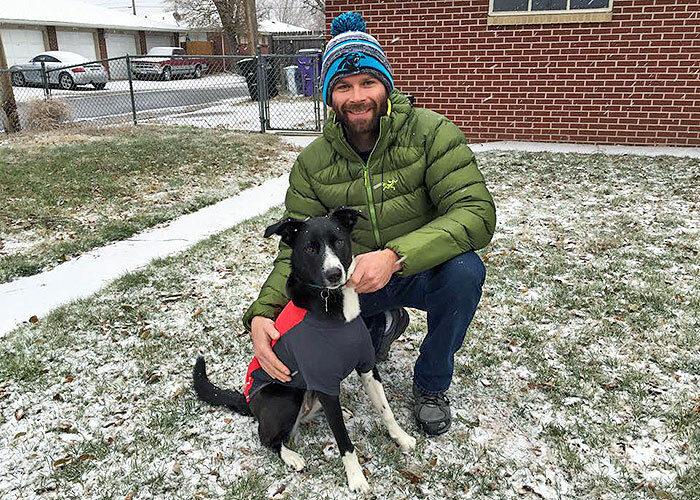 Jeff finished climbing all of Colorado’s famed 14ers in 2012 and has continued his alpine love affair alongside his pup, with the pair pursuing 13,000- and 14,000-foot summits nearly every weekend year-round. Their other hobbies include ice climbing, hiking, snowshoeing, cursing marmots, ranting against the Oxford comma, watching the heart-wrenching display that is Carolina Panthers football and experiencing separation anxiety when Jeff’s girlfriend Liz isn’t in sight. The former daily newspaper journalist enjoys sharing his outdoor knowledge as an instructor for the Colorado Mountain Club and on his blog at www.iceandtrail.com. You can follow Jeff's more photogenic half on Instagram at @climbingcollie.